K2's touring-oriented Backdrop feels a lot like a big, heavy, in-bounds powder specialist. 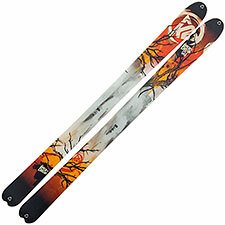 But surprise: the ski weighs only eight pounds per pair. The good news, then, is that the Backdrop does indeed fall into exactly the same category as skis like Volkl's Nunataq or Black Diamond's Justice—it's a wide-bodied floater, tuned for powder performance at a touring-capable weight. In fact, the Backdrop gives you more surface area than either Justice or Nunataq, at basically the same weight (8lbs per pair at 174cm — K2 spec). I confess the powder-touring ski category is at least one level of specialization too far for me. I'm a light skier, at 145lbs, and I don't live in Utah, so the flotation-versus-weight metric isn't high on my list of priorities. Still, I have to admit the Backdrop is an appealing ski within its niche. And, oddly enough, the Backdrop also offers surprisingly good on-trail performance. The Backdrop's edge grip is solid. Hard snow performance is fine. On groomers the Backdrop makes well-behaved long radius turns, and it never feels skittish. No, the Backdrop isn't nearly in the same class as Nordica's Patron or Blizzard's Cochise—but it does have enough of that coveted Big Mountain feel to inspire confidence. Versatility, on the other hand, is mixed. As noted, you're getting an impressive surface area to weight ratio, plus an unexpected dose of on-trail capability. But in the key criteria of quickness, the Backdrop falls well behind both the Nunataq and the Justice, lowering the powder score overall and also lowering the touring appeal in tough snow and tight situations. Let's call the Backdrop an excellent choice within a highly specialized niche—powder touring in fresh, wide-open spaces. You'll like the Backdrop's ability to remain credible in-bounds, and you'll consistently be surprised by how solid the ski feels for its weight. Heavier skiers may well find the Backdrop a touring standout; lighter skiers may wish for a livelier ride.